From right to left are Old Town Cape affiliates Tom Higgins, Marla Mills, Lee Schlitt, and River Heritage Mural Association affiliates Tim Blattner, Chuck Martin,Paul Lloyd, Freck Shivelbine, Don Greenwood and Craig Thomas. 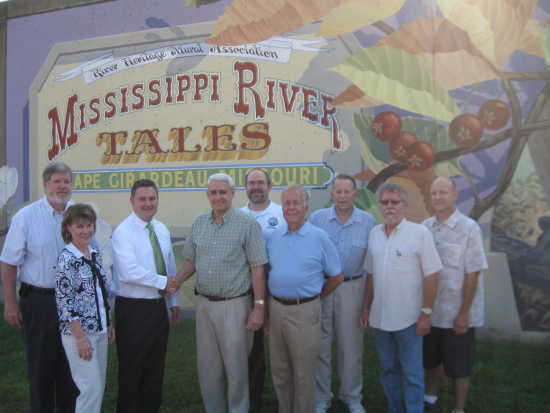 Cape Girardeau -- The River Heritage Mural Association and Old Town Cape, Inc. boards have agreed to merge. The agreement will bring the murals, assets and responsibilities of the Mural Association under Old Town Cape, Inc. The board of the Mural Association will become a subcommittee of Old Town Cape's Design Committee and will continue to have input and help direct the decisions and discussions around the murals and their maintenance. The merger was effective September 1st. The River Heritage Mural Association was organized in 1987 and has been responsible for the painting, repainting and maintenance of 7 murals around Cape Girardeau including the Missouri Wall of Fame and Mississippi River Tales. The Association Board included Tim Blattner, Freck Shivelbine, Don Greenwood, Paul Lloyd, Craig Thomas, Chuck Martin, and Narvol Randol, Jr.
Tim Blattner noted that "for over 20 years the River Heritage Mural Association has worked to paint murals that shared with the world the heart and history of our fine community. Keeping that effort going is very important." Old Town Cape is a nationally accredited Main Street Program that works to build a downtown community that cherishes its past and is an economically viable district in which the citizens of Cape Girardeau can live, work and play.